The massive project, which is feeding a hotel-development boom, will fill in the area with new event space and could speed up the planned closure of a major transit gateway into downtown. 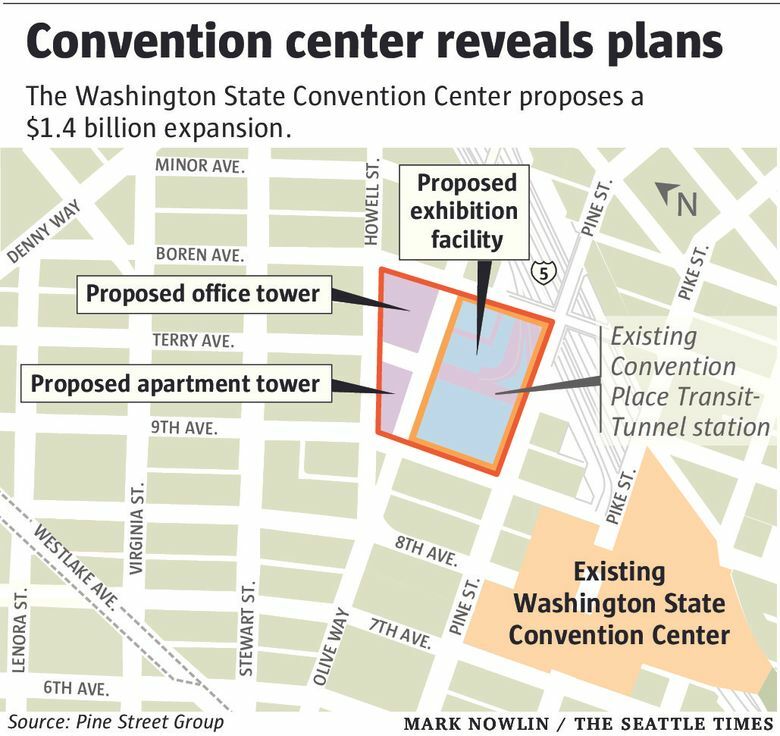 The Convention Place bus station in downtown Seattle could be transformed into a five-story exhibition center, as part of a $1.4 billion plan to double the capacity of the Washington State Convention Center. Construction could begin in the first half of 2017, with the facility opening in 2020, said developer Matt Griffin, whose Pine Street Group is the project manager. That dovetails with a plan by King County Metro Transit to run buses only on the street by 2021 because the bus tunnel will be dedicated to light-rail service. Last year, the 414,722 square-foot convention center hosted 44 events for out-of-town groups that drew 126,000 attendees, said Jeff Blosser, the convention center’s CEO. Those attendees spent an estimated $309.7 million in the area’s hotels, restaurants and other services. “We don’t have any more space, so it’s difficult to generate additional revenue,” Blosser said. Seattle has less capacity than rival convention facilities in Denver, Portland and Vancouver, B.C., he said. The convention-center expansion would add about 440,000 square feet of usable space on the full block bounded by Pine Street, Olive Way, Boren Avenue and 9th Avenue. There would be underground parking for up to 800 vehicles. Across the street, the convention center proposes a 30-story apartment tower with 428 units and a 16-story office building on properties it acquired last year. 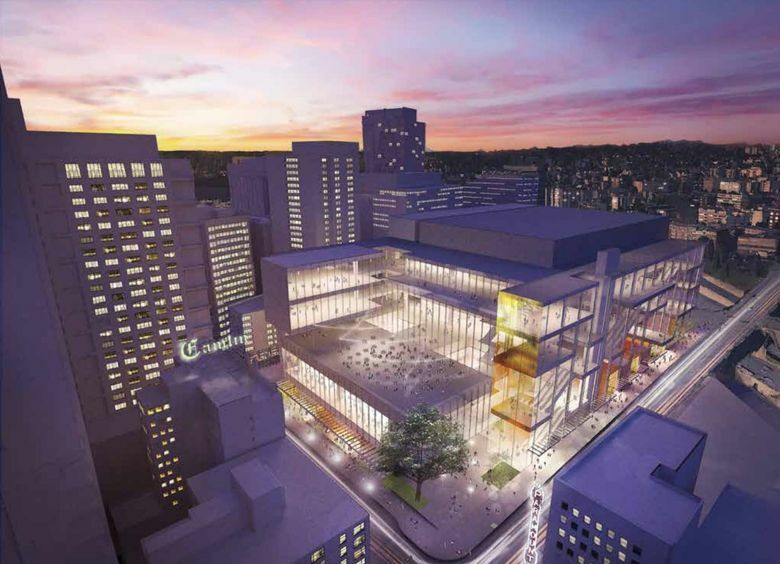 The convention center needs truck ramps below those sites to serve the new exhibition facility, but plans to sell the development rights to the apartments and office building, said Griffin, whose firm manages the project. The $1.4 billion price tag includes the cost of buying property, street replacement and architecture and engineering work, Griffin said. Of the total, roughly $750 million will be spent on construction, he said. The public will have a chance to comment on the designs for the proposed expansion when the city’s design review board convenes at 5:30 p.m. Tuesday at City Hall. The center submitted a 126-page packet to the city recently. In addition to reeling in more convention groups, a second exhibition facility would help local hotels fill rooms throughout the week, officials say. The new facility will be kitty-corner from R.C. Hedreen Co.’s 45-story hotel, the largest hotel north of San Francisco. “Seattle will be a more competitive convention city if it has another large convention hotel,” Griffin said. Tom Norwalk, CEO of Visit Seattle, was at a conference in Austin on Thursday when he heard that Hedreen plans to break ground next month on the new hotel. “We’re just ecstatic,” he said. With the expansion of the convention center, “we think we could book 20 to 25 more conventions a year that we’re not able to book now.” He said the city has been missing out on large tech trade association and professional group conventions for lack of space. Hotel development is booming in anticipation of the convention center’s expansion and to meet current demand. Average hotel occupancy in Seattle is expected to hit 83 percent this year, an all-time high, according to PKF Consulting USA, a subsidiary of CBRE. Average room rates, which jumped more than 10 percent last year, are expected to keep rising strongly over the next few years until more hotels open. Four hotels opened in or near Seattle in the first half of this year, and five more will open later this year, according to a recent market report by John Gordon, a senior appraiser at Kidder Mathews who tracks hotels. At least 11 hotels with nearly 3,300 rooms are under construction or expected to break ground soon, he said. And developers are pitching projects that would add 2,000 more rooms over the next four years. The openings so far this year include the 97-room Palladian Hotel in Belltown, a 172-room Hyatt House Space Needle east of Seattle Center and a 222-room Hilton Garden Inn in the Denny Triangle. Construction has begun on the 184-room SLS Hotel in The Mark tower at Fifth and Columbia, the 158-room Thompson Hotel at 1st and Stewart, and the 278-room Embassy Suites north of CenturyLink Field. “Time will tell if the pending developments prove to be too little or too much,” Gordon wrote.